Baki Hanma competes in an underground fighting tournament organized by Tokugawa. Masters of various fighting styles come from all over the world in order to determine who is the strongest fighter on Earth. Baki fights a rematch with the Yasha Ape. 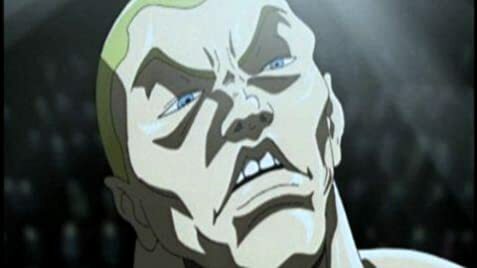 Baki Hanma is a expert martial artist who enters a martial arts tournament and can never be defeated, until he goes up against Kosho Shinogi, a man who wins his matches by ripping out his opponent's jugular veins. Ippo continues to defend his title and training to reach his goal, Ichiro Miyata. While Takamura goes for the world, and faces the world champion, Brian Hawk. In what is to become his toughest fight so far. "Baki" - The ultimate fight Anime'? I saw the two-season series collection DVD for "Baki the Grappler" at Best Buy and I knew I had to beg my mother to get it for me for Christmas. Alas, I was not disappointed Christmas Day when I got my wish. I eagerly popped in disc one and was blown away by several repeated kicks to the senses of what I see as the ultimate fight Anime'! My friends and I are used to the likes of watching live-action martial arts movies, but so few martial arts fight Anime' features. I'm the only one of us who has dared to experience the intensity (and overall insanity, with occasional bits of surrealism thrown in for good measure) that is "Baki the Grappler." An adaptation of the Japanese Manga series created by Keisuke Itagaki, the show follows the long and brutal path of 13-year-old Baki Hanma to proclaim himself the best fighter in the world. It's a long, hard to quest to be the best, since his father Yujiro Hanma already has that title and is pretty much the strongest living creature on the planet, although IMHO, he might as well as be The Devil Himself (you'll eventually see why). It's obvious that Baki has a big chip on his shoulder, not only to prove to the world that he is the best, but he also has to prove it to himself, as well (lending the series an unpretentious emotional edge rare for this sort of thing). At such a young age, he's already pushed himself to the limit and beyond, both physically and mentally, to be the best fighter in the world. 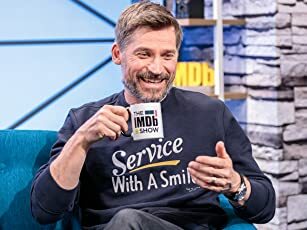 The series does a good job of tracking his maturation from a brash young street brawler to a seasoned and intelligent martial artist who has earned legions of respect from his fans as well as other legendary fighters. The series at first begins like any action/crime thriller we've become so used to in the past. But about five episodes in, things suddenly change into a great new direction and never looks back. Also, some have made about comments about how there's no false drama or theatrics in this show. That's good, not bad. All we get here is straight-up action and nothing more, even though we grow to really like Baki, regardless of how deeply troubled he may be, and there are a few unexpectedly tragic moments during the series that does prove that even fighters have a heart. Still, "Baki the Grappler" is first-rate fight Anime'. There's a wide variety of martial arts disciplines on display here, including boxing, Brazilian Jiu-Jitsu, Chinese gong-fu, Karate, Kickboxing, Judo, Jujutsu, Muay Thai, Russian SAMBO, Sumo, Tae Kwon Do, wrestling, and some good old-fashioned straight-up brawling. Needless to say, Baki is able to dish out beatings and take a few himself, and still walk right on into the next fight. It also goes without saying that Baki, and most of the fighters he battles with, are pretty much superhuman because their stamina and endurance during scenes of intense combat is nothing short of just that - superhuman. One of these battles includes Baki's mountain-top brawl with a giant ape that's probably the mutant offspring of King Kong and Bigfoot. 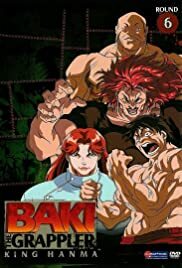 "Baki the Grappler" is up there with some of the greatest martial arts Anime' features from Japan, certainly one of the greatest animated martial arts features, period, for sure. Its two-season, 48-episode run may be pushing it for some tastes, but I guarantee you that you'll never be sleeping with so many repeated kicks to the head, and a few vague references to the martial arts philosophies of Bruce Lee, to keep you interested, and conscious. Japanese heavy metal band Dir en Grey performs the opening theme song of each episode, "Child Prey."